I’m a Farhan Akhtar fan, whether he’s working as an actor-producer in movies like Rock On! !, Luck By Chance and Karthik Calling Karthik or writing and directing action flicks like 2006’s Don. If there’s any filmmaker who could parlay Bollywood success into Hollywood success, it’s Akhtar. After watching the first film he wrote and directed, Dil Chahta Hai, I’m more convinced than ever. Akhtar’s debut effort is part buddy comedy, part coming-of-age drama about three friends fresh out of college. Sameer (Saif Ali Khan) falls in love fast and gets his heart broken easily. 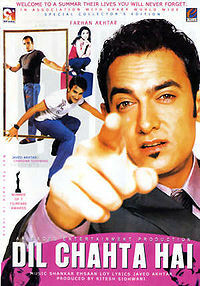 Akash (Aamir Khan) is a cynic who only believes in brief flings. Sid (Akshaye Khanna) has a view of love that’s somewhere in between. The plot gives equal amounts of time to all three of the guys, making it hard to tell if there’s really a main character in Dil Chahta Hai. The honor probably goes to Akash, as he goes through the most profound character transformation, but it’s nice to see a buddy movie that’s really about buddies, not just a main character and his sidekicks. The story follows the three pals as they reluctantly begin their adult lives. On a road trip to Goa, they pledge their undying friendship to one another, but things change when they return home. Sameer balks at his parents’ plans to choose a bride for him — until he meets the bride-to-be. Pooja (Sonali Kulkarni) is pretty and independent, but she already has a boyfriend. Sameer sets about trying to win her for himself. Sid’s love story is unconventional. He befriends an older, divorced woman who moves into the neighborhood and takes an interest in Sid’s paintings. Tara (Dimple Kapadia) is no seductress, but Sid becomes captivated by both her beauty and her tragic life story. When Sid discloses his feelings for Tara to his friends, Akash and Sameer initially react with surprise. When Akash jokes that Tara — an experienced divorcee with her own house — is the perfect woman for all of them, Sid punches him. Sid leaves the next morning to study at an artist’s colony, and Akash leaves for Australia a few days later. On the plane, Akash runs into a girl he’d once flirted with at a nightclub (played by Preity Zinta), thus beginning his own love story. The charm of Dil Chahta Hai is its realism. Akhtar made a point of writing dialog that sounds authentic, rather than the flowery exposition or lengthy speeches typical of a lot of movies. It’s predictable, but in a way that allows the emotions of the story to come through organically. Akhtar’s careful to balance the melodrama with humor. True friendships thrive on a diet of laughs, so Dil Chahta Hai is often very funny. Some of the numerous song-and-dance numbers are even a bit surreal, further lightening what could be a heavy movie. I’d say that Dil Chahta Hai is a great Bollywood movie, but it doesn’t even need the qualifier: it’s just a great movie. One of these days, some Hollywood studio is going to notice Farhan Akhtar and throw millions of dollars at him to make movies for a global audience. The world will be better for it. This entry was posted in Reviews and tagged 2001, 4 Stars, Aamir Khan, Akshaye Khanna, Bollywood, Dil Chahta Hai, Dimple Kapadia, Farhan Akhtar, Hindi, Indian, Movie Review, Preity Zinta, Saif Ali Khan, Sonali Kulkarni on August 17, 2010 by Kathy. my favorite bollywood movie. Ya its farhan akhtar movie but its amir khan who is the actual star. No one else can play akash the way he did. Its always amir khan movie which r liked by the global audience n he deserves it. Whether its lagaan or mangal pandey or rang de basanti. I hope u have seen these movies. Zindagi na milegi dobara is inspired from dil chahta hai i think, plot is similar. Lagaan is the film that got me interested in Indian cinema, TS. I love Rang De Basanti, too. kathy did u really enjoy lagaan, cos its based on cricket and its hard to enjoy the movie without cricket knowledge specially the climax scene when amir khan hits the last ball for six. Dont get me wrong and dont get angry please. i am just assuming that u dont know cricket cos most americans dont know the game. Lagaan is actually a great way to learn about cricket. Since the movie is four hours long, it has plenty of time to explain rules and strategy to people (like me) who didn’t grow up watching cricket. It’s a very accessible movie for Americans. This is probably the most detailed analysis of this amazing movie….